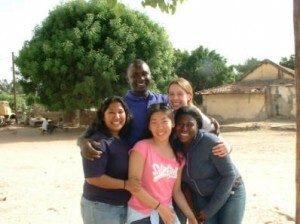 Williams supports summer programs and Winter Study opportunities in Africa. Winter Study courses and summer programs are relatively short, which makes them a good entry point for students who are intimidated by the prospect of travel in countries very different than their own, but they are long enough to be a formative experience for many students, changing their choice of major and their sense of the kinds of work they might want or be able to do upon graduation. In addition to the summer internship opportunities at EPRI in Cape Town and summer teaching opportunities with Konyango in Kenya, opportunities in Africa include Winter Study travel courses and support for travel independent studies (WSP ’99’s). Past courses have been led by David Eppel, Kiaran Honderich, Scott Lewis, and Michael Samson. Recent examples include WGSS 25: Creating Social Enterprises with Marginalized Ugandan Youth (2015), led by Professor Kiaran Honderich and SPEC 24: Community Development Work in Liberia (2014 & 2017), led by Williams Outing Club Director Scott Lewis.